We see black squirrels every day in our yard. After we moved here 12 years ago, I was curious to learn more about them as I had not seen them in southern Ohio. They are found in pockets of the US, Canada and Britain, usually not native to those areas. They are a genetic variation of the Eastern Grey Squirrel. The black squirrels in our area of Northeast Ohio are descendants of a group of ten that were imported from Ontario, Canada in 1961 by either a Kent State University grounds supervisor or a biology professor or perhaps both working together, stories differ. We live 30 miles north of Kent in the southwest corner of Geauga County, Ohio. We see them below our squirrel proof feeder more often than the Eastern Gray squirrels or the occasional orange tailed Fox squirrels. They are dominant in personality to the other two, they seem to be smarter and more aggressive. Not sure if this is considered fact or just my observation. Do you like squirrels? I think our yard would be so boring without them. I love seeing life and activity around our feeders. 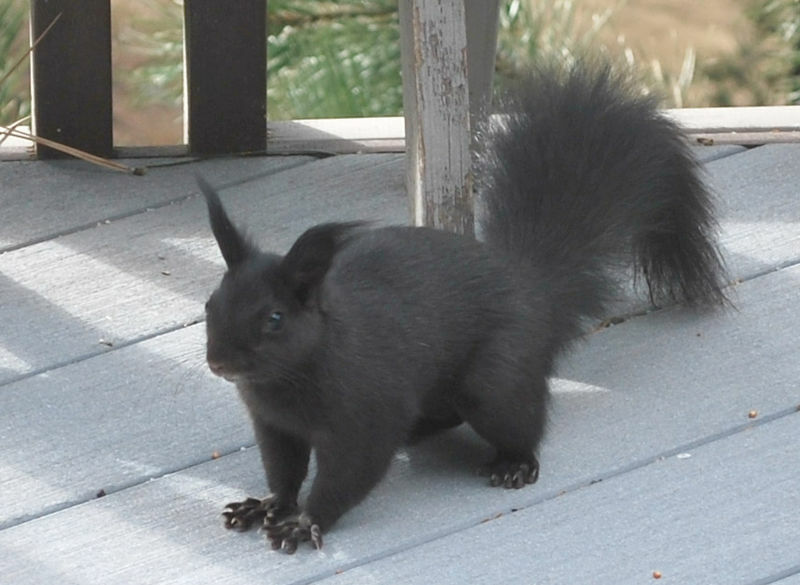 Do you have black squirrels where you live? Hello Cindy, During the years I lived in Moreland Hills, I had tons of squirrels in my yard (among other wildlife), but I never saw any black squirrels, although we used to see lots of them when driving through Kent. Perhaps they;re starting to spread out now. How fascinating! We do not have black squirrels where we live, just grey ones and they can be very pesky. We love to feed the birds and squirrels are quite a nuisance. We have a great squirrel-proof feeder though, plus another regular one that the squirrels enjoy. We also recently bought a cedar nut butter feeder. I believe the squirrels are loving it, and haven't seen a bird at the feeder yet. I have never seen a black squirrel in New England...just gray and the small red ones. They appear to have such large fuzzy ears which give them a comical look. Wonderful photos! I, too, love watching squirrels. And yes, the squirrel in your last photo does have unusually tufted ears for a gray squirrel - which is what black squirrels are, a color variation of the gray squirrel rather than a species of their own. Still, I have heard other people say, as you do, that they seem to be particularly aggressive or dominant, which is interesting. In England, grays and blacks are considered invasive species that are driving out the native red squirrel. Fascinating. I love the black squirrels! I see one occasionally. Always in the same spot. I'm in central Ohio. We only have grey and Rex squirrels here in the Missouri Ozarks but I love them, we feed them corn and they raid our feeders...lol! I LOVE your black ones...wish we had them, in Marionville Missouri, just about 40 miles southwest of us the have white squirrels and tons of them, they are famous there and protected. Here in northeast Kansas, we occasionally see black squirrels. St. Marys KS has lots of them, which seem to be as prevalent as the ordinary red squirrels. But here in Topeka, it is a rare privilege to see them. This past year, we had one show up in our back yard on a daily basis last year. Maybe we will see a few more this year!